Product prices and availability are accurate as of 2019-04-20 10:59:05 EDT and are subject to change. Any price and availability information displayed on http://www.amazon.com/ at the time of purchase will apply to the purchase of this product. 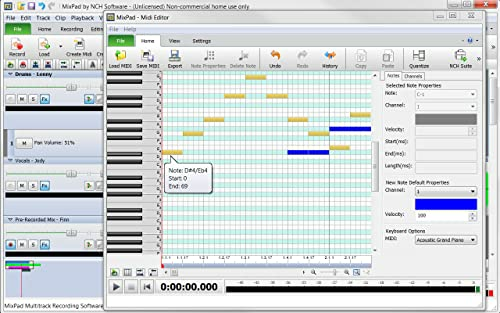 MixPad Free Multitrack Recording Software is a powerful sound production and music mixing software. 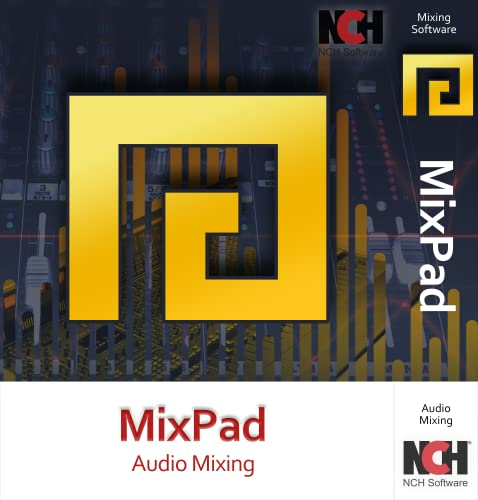 Whether a novice or professional, MixPad has the strength to create breathtaking audio, yet it is designed with an easy-to-use and intuitive interface to allow you to make your tracks in a matter of minutes. With MixPad, enjoy the multitrack recording features and the ability to mix an unlimited number of music, voice and audio tracks at once. Drag and drop your music, audio, voice and even video tracks into MixPad and start editing. Perfect your music by applying interesting effects and tweaking your beats with helpful tools. Once you’re done, share your wonderful audio and music with friends, family, or colleagues, add them to a video or slideshow project, or make them your next ringtone. MixPad is like having your own personal recording studio at your fingertips! Drag and drop tracks directly into MixPad for convenience. 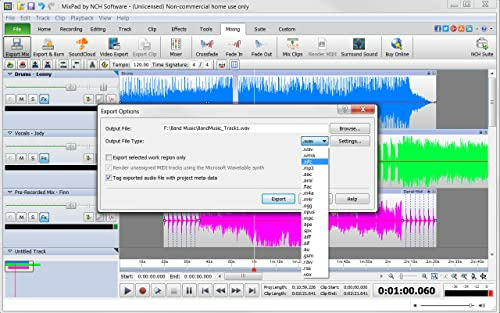 Add audio, music and voice tracks from the many file formats that can be imported. Pull audio directly from your movies. Record your own songs, sounds and other audio from the interface. Take stock sounds from the extensive NCH Sound Library. Edit your tracks with trim, split, join, or one of the many other editing features. Enhance sound quality with pitch correction, surround sound setup, and other quality control features. Customize your sound with interesting effects, like crossfade, echo, and distortion. Apply multiple to all of the effects with the Effect Chain. Use the Beat Designer to edit and make beats. Create your own midis with the Midi Creator tool. Add Bookmarks to organize and mark points in your track. Attach ID tags to label your tracks with important information, such as genre, artist, title and dates. Upload directly to your SoundCloud account. Export locally to your computer or burn to disc in over 20 of the most popular file formats. Save your audio and music tracks online on Dropbox or Google Drive. Access NCH Suite to seamlessly integrate with one of our other multimedia applications. 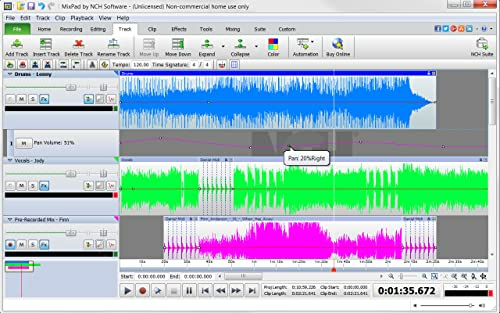 VideoPad: Video editor that has the ability to add your audio to movies. Voxal Voice Changer: Record your audio or songs and adjust your voice. Tone Generator: Play with your waves and noise and use them interchangeably between MixPad and ToneGen. Switch: Can’t find your desired file format, Switch has over 50 to choose from for your conversions. SoundTap: Take audio streaming off your computer, TV, or other devices and record them into usable tracks. 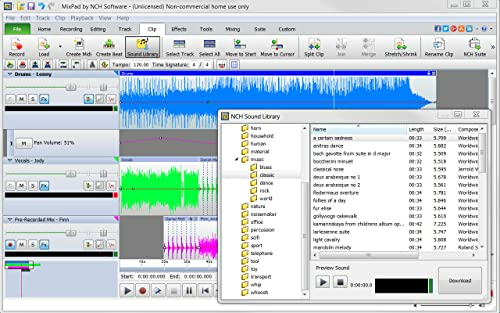 Create a mix using audio, music and voice tracks and recordings. Customize your tracks with amazing effects and helpful editing tools. Use tools like the Beat Maker and Midi Creator. Work efficiently by using Bookmarks and tools like Effect Chain, which allow you to apply multiple effects at a time Use one of the many other NCH multimedia applications that are integrated with MixPad.